Weather is what's happening in the atmosphere on a given day, in a specific place. Local forecasts include temperature, humidity, winds, cloudiness, and prospects for storms or other changes over the next few days. Climate is the average of these weather ingredients over many years. Some meteorologists say that "climate is what you expect; weather is what you get". Metro Manila has a tropical savanna climate with dry winters. Over the course of a year, the temperature typically varies from 22°C in January to 34°C in May. The sky is cloudiest in August and clearest in April. Precipitation is most likely in July and least likely in April. The relative humidity typically ranges from 51% (mildly humid) to 97% (very humid). The air is driest in April and most humid in August. The Climate of the Philippines is either tropical rainforest, tropical savanna or tropical monsoon, or humid subtropical (in higher-altitude areas) characterized by relatively high temperature, oppressive humidity and plenty of rainfall. There are two seasons in the country, the wet season and the dry season, based upon the amount of rainfall. This is dependent as well on your location in the country as some areas experience rain all throughout the year (see Climate Types). The seven warmest months of the year are from March to October. The winter monsoon brings cooler air from November to February. May is the warmest month, and January, the coolest. Type I.. Two pronounced season: dry from November to April and wet during the rest of the year. There are three recognized seasons: Tag-init or Tag-araw (the hot season or summer from March to May), Tag-ulan (the rainy season from June to November), and Taglamig (the cold season from December to February). 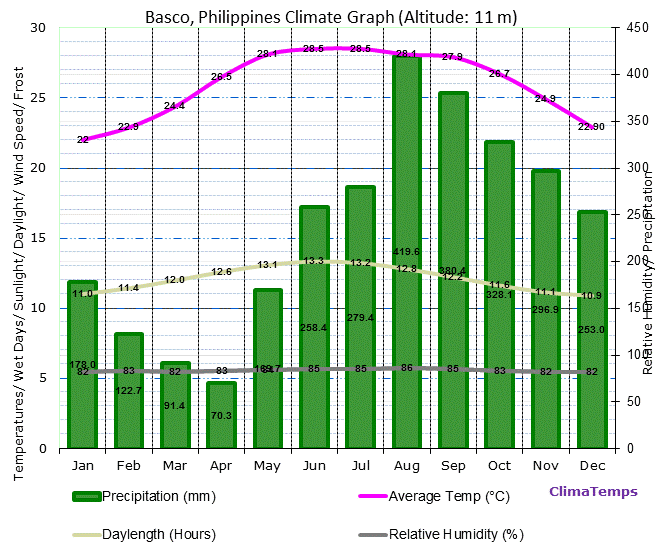 The humid southwest monsoon (May-October) is known as "Habagat". 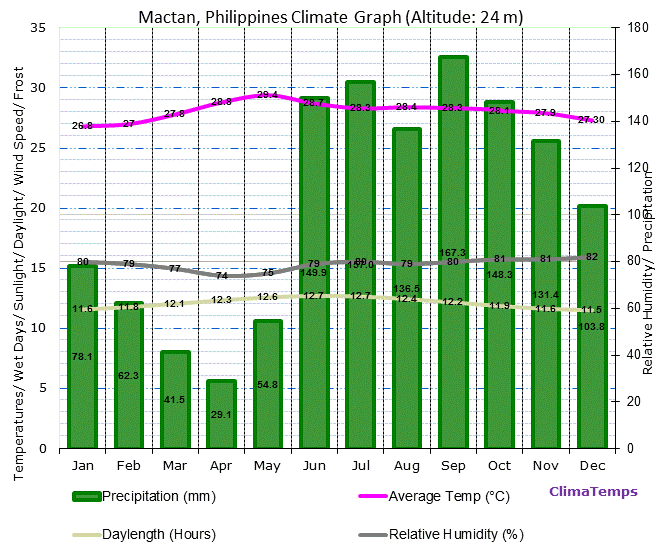 The cool and dry winds of the northeast monsoon (November April) are called "Amihan". These seasons can seriously get mixed up by the El Niño / La Niña effects. El Niño brings dry weather and even droughts. 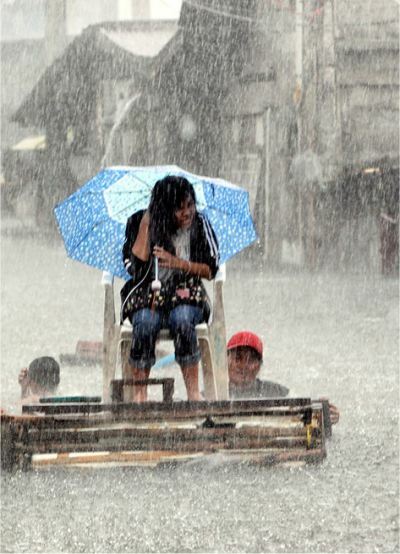 La Niña stands for rainy weather and floods. Either you know when you will be here and then look for the places with the best weather. Or you know where you want to go and choose the month with best weather conditions. The climate diagrams below may help you to find the right place at the right moment. All these climate diagrams and worldwide more than 4000 can be found on the website ClimaTemps. We always use them to plan our vacation and can recommend them. How to read a climate diagram? A climate diagram has 12 columns, one for each month of the year. J = January to D = December. The vertical bars (blue or green) indicate the total monthly precipitation. The right scale shows the monthly amount of rain in millimeters. These scales may change between different diagrams. The 3 lines indicate the maximum, average and minimum daily temperatures. 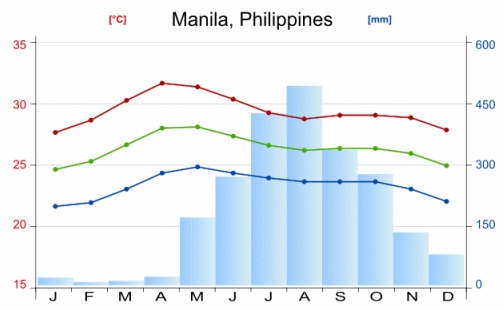 Though in June in Manila you may expect 280mm rain or about 9mm per day. Maximum temperature will be around 31°C, minimum temperature will be "freezing" 24°C. Click on the diagrams to enlarge. 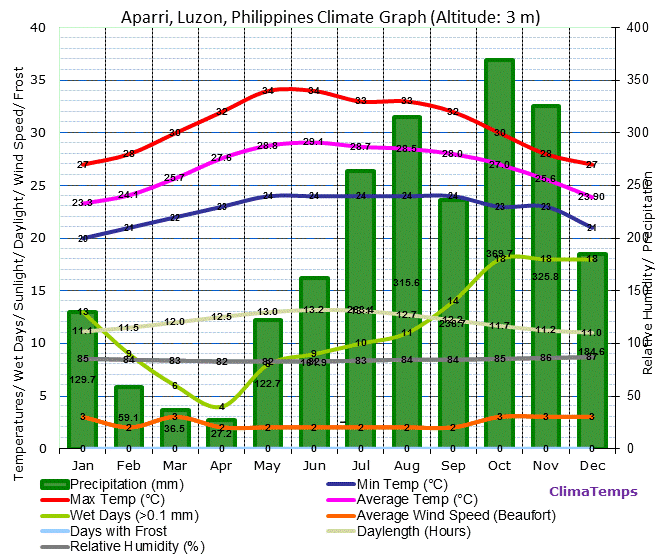 Aparri has a tropical monsoonal climate with a dry season and a heavy monsoon the rest of year, no cold season. The annual average temperature is 26.7° Celsius (80.1° Fahrenheit). 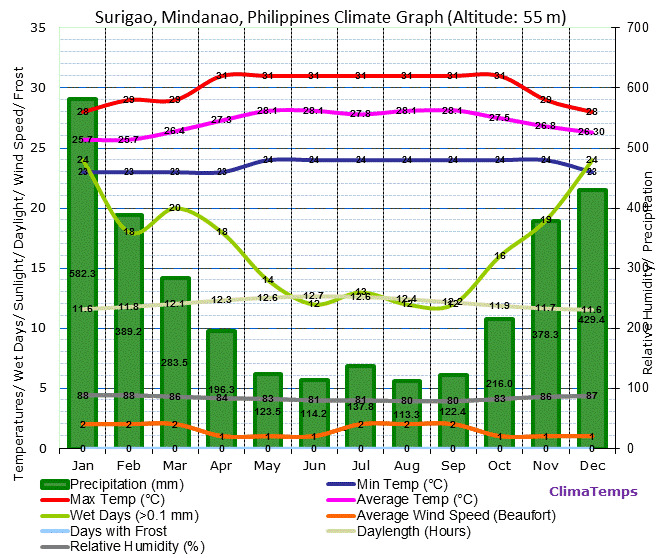 Average monthly temperatures vary by 5.8°C (10.4°F). Total annual precipitation averages 2232.9 mm (87.9 inches) which is equivalent to 2232.9 Litres/m2 (54.77 Gallons/ft2). 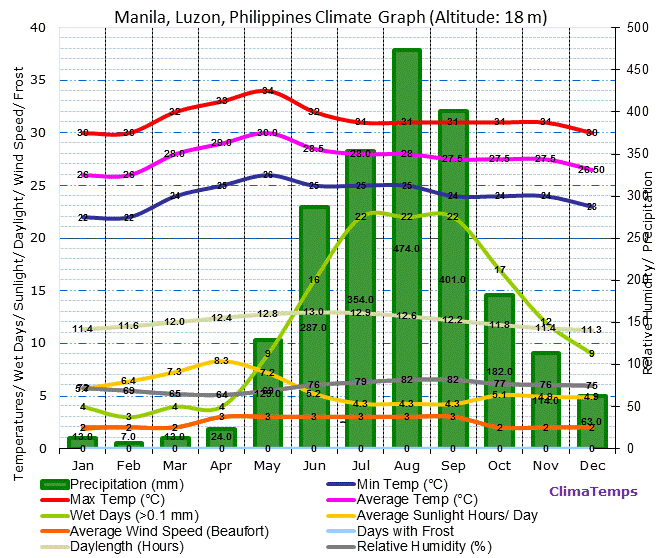 Manila has a tropical wet and dry/ savanna climate with a pronounced dry season in the low-sun months, no cold season, wet season is in the high-sun months. The mean annual temperature is 27.7°Celsius (81.9°Fahrenheit). Average monthly temperatures vary by 4°C (7.2°F). Total annual precipitation averages 2061 mm (81.1 inches) which is equivalent to 2061 Litres/m2 (50.55 Gallons/ft2). 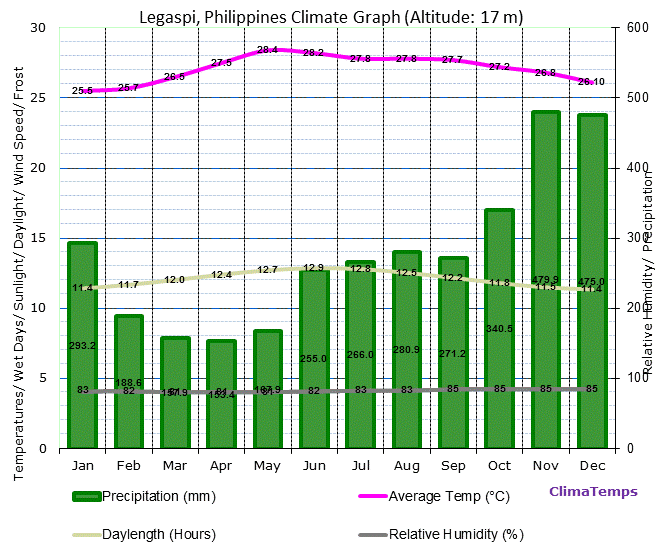 Legaspi has a tropical wet climate with no dry or cold season as it is constantly moist (year-round rainfall). The annual average temperature is 27.1° Celsius (80.8° Fahrenheit). Average monthly temperatures vary by 2.9°C (5.2°F). Total annual precipitation averages 3329.5 mm (131.1 inches) which is equivalent to 3329.5 Litres/m2 (81.66 Gallons/ft2). 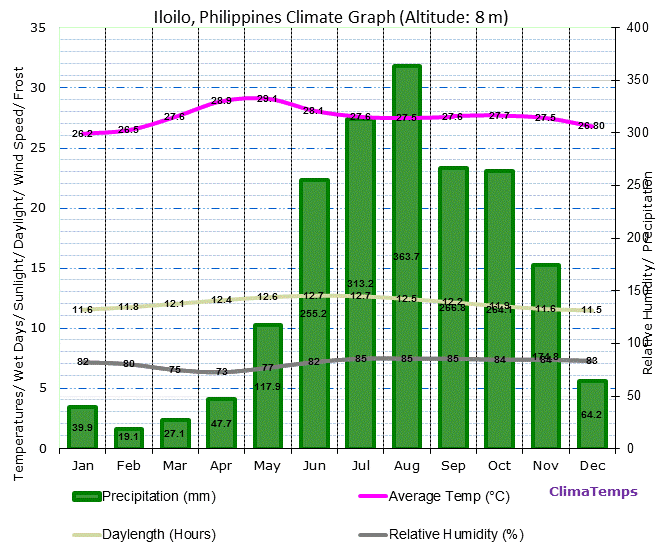 Iloilo has a tropical wet and dry/ savanna climate with a pronounced dry season in the low-sun months, no cold season, wet season is in the high-sun months. The average annual temperature is 27.6°Celsius (81.7°Fahrenheit). Average monthly temperatures vary by 2.9°C (5.2°F).Total annual precipitation averages 1953.7 mm (76.9 inches) which is equivalent to 1953.7 Litres/m2 (47.92 Gallons/ft2). 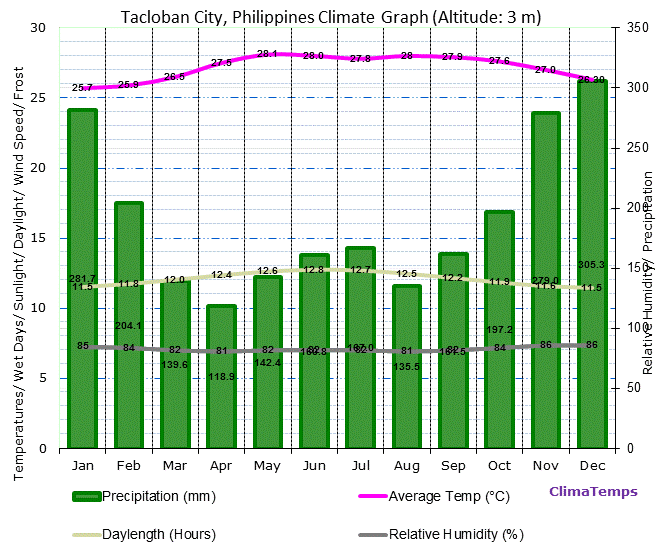 Tacloban has a tropical wet climate with no dry or cold season as it is constantly moist (year-round rainfall). The annual average temperature is 27.2° Celsius (81.0° Fahrenheit). Average monthly temperatures vary by 2.4°C (4.3°F). Total annual precipitation averages 2293 mm (90.3 inches) which is equivalent to 2293 Litres/m2 (56.24 Gallons/ft2). Cebu has a tropical wet and dry/ savanna climate with a pronounced dry season in the low-sun months , no cold season, wet season is in the high-sun months. The mean annual temperature is 28.1°Celsius (82.6°Fahrenheit). Average monthly temperatures vary by 2.6°C (4.7°F). Total annual precipitation averages 1260 mm (49.6 inches) which is equivalent to 1260 Litres/m2 (30.9 Gallons/ft2). Puerto Princesa has a tropical wet and dry/ savanna climate with a pronounced dry season in the low-sun months, no cold season, wet season is in the high-sun months. The annual average temperature is 27.4° Celsius (81.4° Fahrenheit). Average monthly temperatures vary by 2.9°C (5.2°F). Total annual precipitation averages 1607 mm (63.3 inches) which is equivalent to 1607 Litres/m2 (39.42 Gallons/ft2). 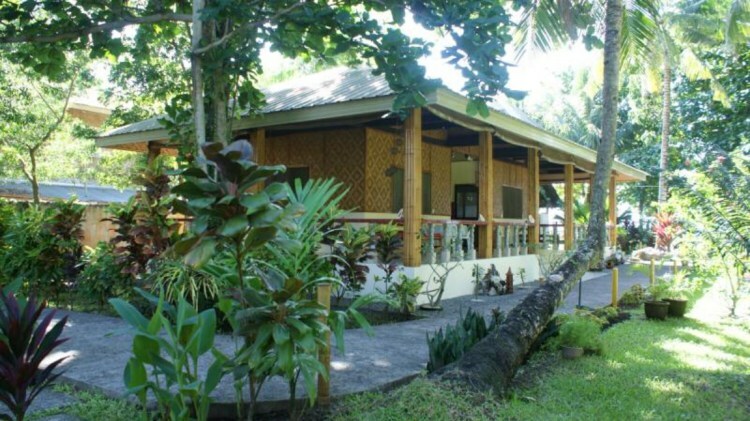 Surigao has a tropical wet climate with no dry or cold season as it is constantly moist (year-round rainfall). The annual average temperature is 27.2° Celsius (81.0° Fahrenheit). Average monthly temperatures vary by 2.4°C (4.3°F). Total annual precipitation averages 3086.2 mm (121.5 inches) which is equivalent to 3086.2 Litres/m2 (75.7 Gallons/ft2). 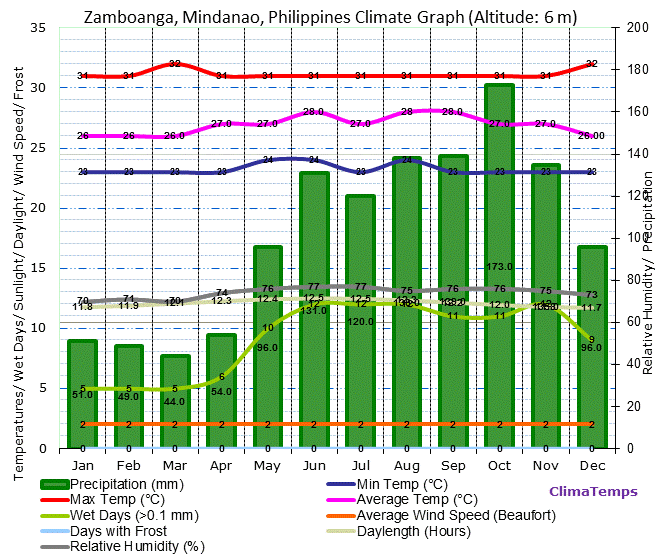 Zamboanga has a tropical wet and dry/ savanna climate with a pronounced dry season in the low-sun months, no cold season, wet season is in the high-sun months. The annual average temperature is 26.9° Celsius (80.5° Fahrenheit). Average monthly temperatures vary by 2.0°C (3.6°F). Total annual precipitation averages 1226 mm (48.3 inches) which is equivalent to 1226 Litres/m2) (30.07 Gallons/ft2)). 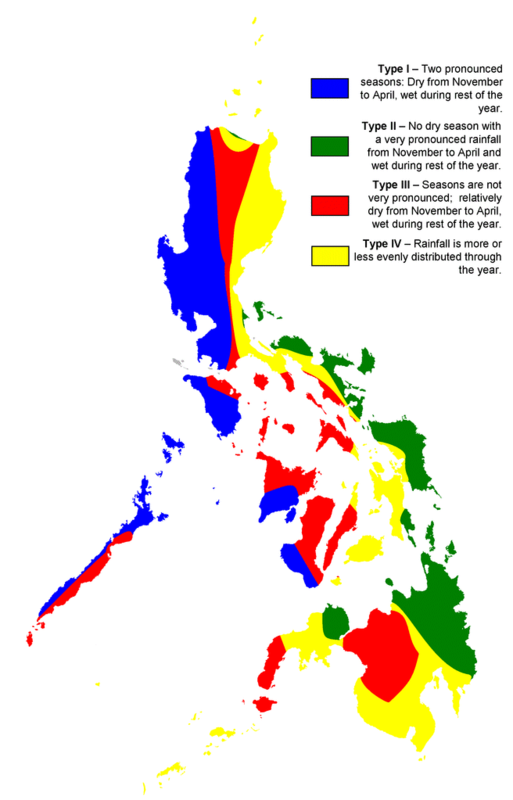 The Philippines dry season starts in December and runs through to about June. This period does not encounter any monsoons, you do however have the consistent trade winds blowing from north-east which are generally dry. Don't let this fool you as you are in the tropics and rain can fall any day. If it rains in the dry season it will usually be a nice afternoon shower to cool you down and wash the dust away, more relieving than anything else. 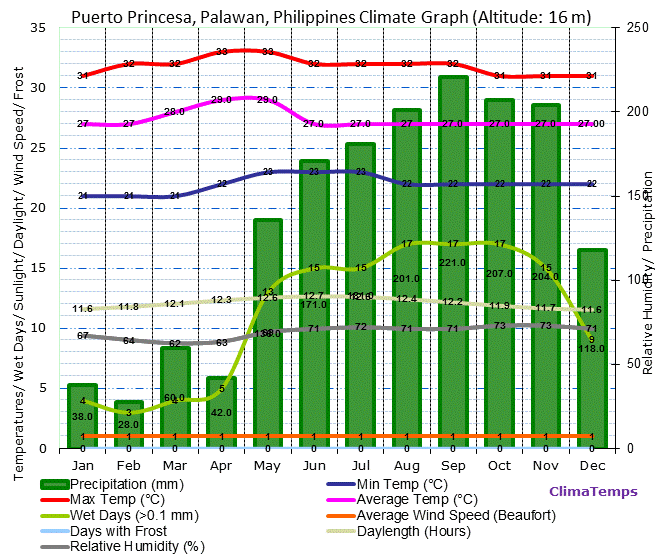 Within the Philippines dry season you will encounter two temperatures. During the months of December to February you can expect cool and dry weather. January is the coolest month of the year, when we say coolest you can expect a temperature around 22 degrees Celsius, which is really quite nice. Up in the Cordilleras they nearly freeze at 6 degrees Celsius. From March to June you can expect hot and dry weather. May is the hottest month of the year, you can expect temperatures in the high thirties degree Celsius and at night , if it gets below 27 degrees Celsius, then you are lucky. Make sure you have air conditioning or at least a fan. If you are traveling in May we suggest you head up to the Summer Capital of the Philippines , Baguio. This is where the majority of the rich in Manila travel, so they can escape the heavy humidity and heat on the coast. December and January can be very nasty in the southern Visayas. Sometimes all a week long the sky is gray and it rains 24 hours a day. This season is more appropriate to visit the north of Luzon e.g. 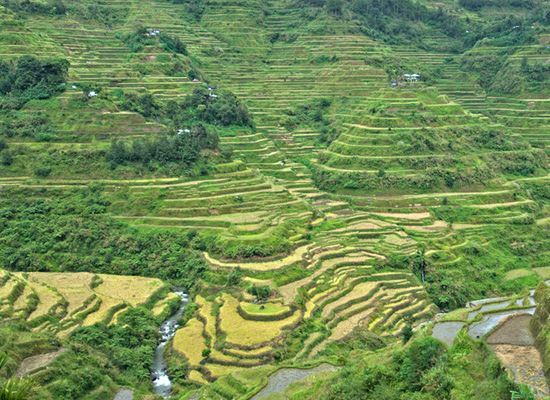 the rice terraces of Banaue and Cagayan Valley. With the high humidity and heat of the months May and June it is not surprising that something has to give, it just cannot stay this sticky forever and you are right. The season will break, usually in July. It is July through to November that the rains come and boy do they come. These rains are called monsoons and are a constant wind bringing rain. Each year during the southwestern monsoon the Philippines climate also attracts typhoons which batter the Pacific eastern coastline of Luzon , Samar , Leyte but nearly never Mindanao . The typhoons come in from the Western Pacific in a north-westerly direction, they also whip up the Philippines surf. In the last years we counted less typhoons per year but they were more violent and made landfall in the north and in the south. In 2009 a series of four cyclones battered northern Luzon in one month. If you are traveling during July, August and September, expect rain everyday. One of the good aspects of travel during the rainy and wet season is the cloud cover. I know, I know you want the sun, but don't forget the sun can be pretty unforgiving in the tropics and after half an hour of unprotected sun exposure your holiday could be bound for the indoors in any event. So consider the cloud cover as a time to enjoy the outdoors without getting burnt bright red like a cooked lobster. The clouds can be your friend, shielding you from the harshest direct sun and also providing cooler temperatures. A pretty good bonus if you ask me. The down side of course is the rain and the odd storm. But typical of tropical climates, the afternoon showers are a relief and something to look forward to. There is nothing better than having a cool drink overlooking the deep blue of the ocean watching the storm build and break and then disappear. The rainy or wet season is perfect to visit the southern Visayas: Bohol, Siquijor, Panglao and Camiguin - and not to forget Mindanao. Mindanao is south of the typhoon belt and even the southern Visayas encounter a typhoon maybe once in ten years. Every year tropical cyclones build up over the northwestern Pacific. In the first phase they usually move from southeast to west. Then most of them, but not all, veer towards north and then north-east. Some of these cyclones leave crazy tracks. 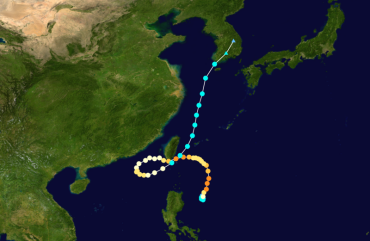 In 2012 typhoon Tembin/Igme passed twice at Taiwan's southern coast. 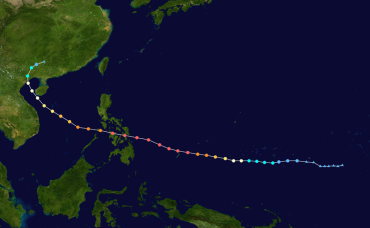 The strongest cyclone that ever did make landfall had been Haiyan/Yolanda in November 2013. This Super Typhoon Cat.5 devastated parts of Leyte and Samar and left a trace of destruction over the central Visayas. These cyclone tracks can be found on Wikipedia. We analyze all tropical storms and typhoons of 100°-140° east and 0°-40° north from 1950 to now. We only count storms with sustained wind speed (10 minutes average) of over 65 km/h. About 50% of all storms does not make landfall and only few touch the Philippines. 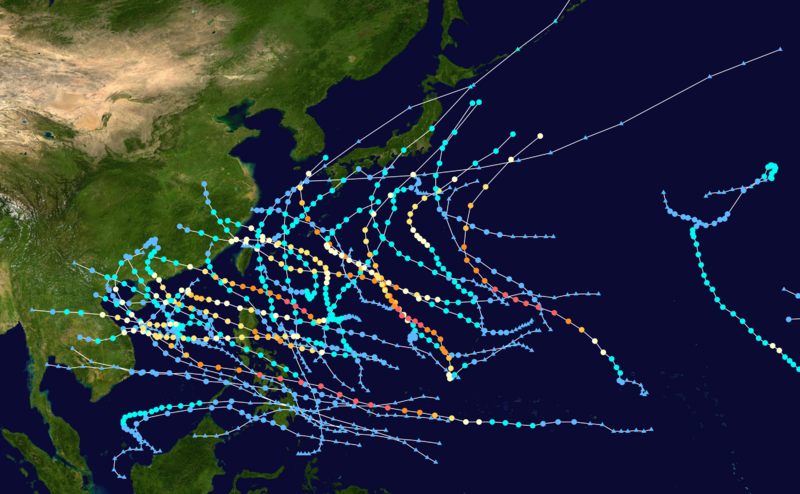 The 63 years average is 26 storms and typhoons per year over the northwestern Pacific. January to end of April can be considered as storm/typhoon free months. May and June and later in the year November and December are moderate with an average of 2 storms/typhoons making landfall in the Philippines. But from July to end of October there are up to 6 tropical storms or typhoons making landfall in the Philippines. Most typhoons hit northern Luzon with a yearly average of 3.7 storms. Then follow the Central Visayas with 2. storms per year and the Eastern Visayas - Leyte/Samar with 1.9 storms. The Bicol region and the National Capital Region (NCR) count 1.2 storms that make landfall. 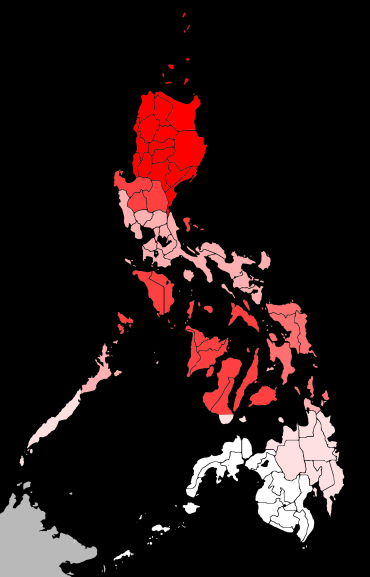 The safest regions are Mindanao and southern Palawan. South-western Mindanao nearly never gets hit by a strong storm.